I love being the host! Of course there is a lot more work to be done when you're the host. Cooking, cleaning, co-ordinating everyone, juggling service and conversation and of course the clean up but I still get a kick out of creating something special for my guests. Needless to say then that when I knew it was my turn to host Christmas lunch this year I was thrilled. We recently had our outdoor area renovated so I was even more eager to splash out this year and create some special table settings. Christmas is already a little hard on the wallet though so when you're catering for a large group though (14 for me this year) it can get a little pricey especially if you're buying all new tableware and decorations. 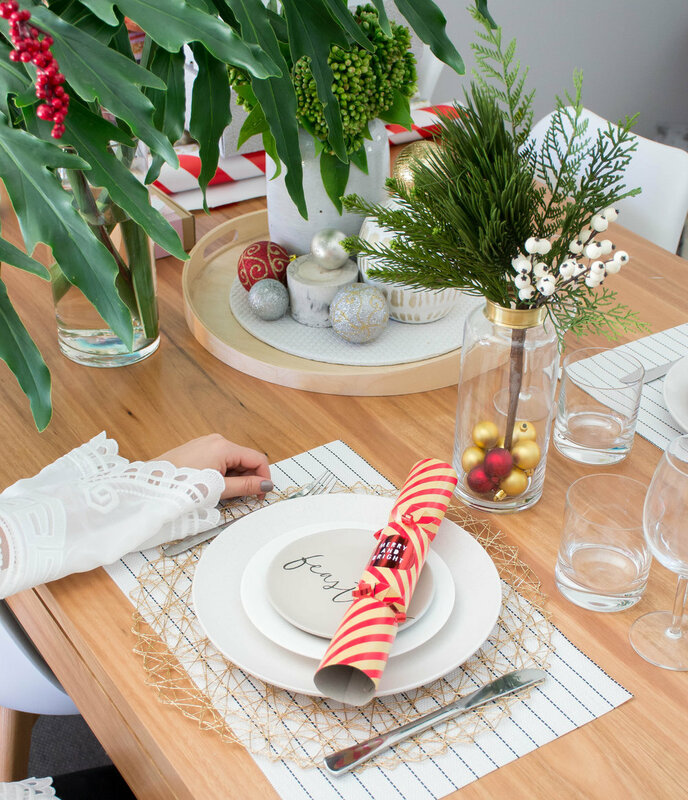 That's why I wanted to share my tips for creating a gorgeous Christmas table setting while keeping your Christmas budget under wraps (pun intended). I'm just gonna go ahead and say it, Kmart is my happy place! The snobby stigma about discount stores is gone and there are so many great budget stores you can source from when looking for anything from homewares, glassware, tableware, decorations and gift wrapping you really don't need to spend a fortune. I picked up matching dinner plates from Target for only $1 each and glasses from $1.50 each. Red Dot & The Reject Shop are also great for picking up glassware and Christmas Decorations from $2 a piece so you can buy bulk and not break the bank. Now I know this sounds like a Christmas nightmare but a lot of stores are starting their Christmas clearance sales the week before Christmas now, especially for things like decorations and Christmas themed homewares and party supplies. That means you can grab a bargain on things you need for this years table setting if you wait to buy them the week before Christmas. I love having fresh flowers or greenery as a centrepiece for table settings but let's face it in our Summer heat they don't usually last long and replacing them constantly can be expensive. I've never really been an advocate for fake flowers, they always seem so tacky but you can get some really lovely ones now if you know where to look. Freedom stock a lovely range and although they are a little more expensive they will last forever and you can reuse them in next years table setting so no need to fork out more money the following year. I was able to create a lovely table setting this year incorporating new items as well as pieces I already had in the cupboard. Because I had such a large group this year I needed to buy matching base plates but by doing an alternate pattern of the top two dishes in my plate stack I could reuse dishes I already had and bought fewer new dishes. Don't forget you can also give existing pieces a Christmas feel just by adding some Christmas decoration. This year I used small Christmas Baubles in the bottom of vases I already had and added them to an existing table centrepiece as an inexpensive way to dress them up for the occasion.